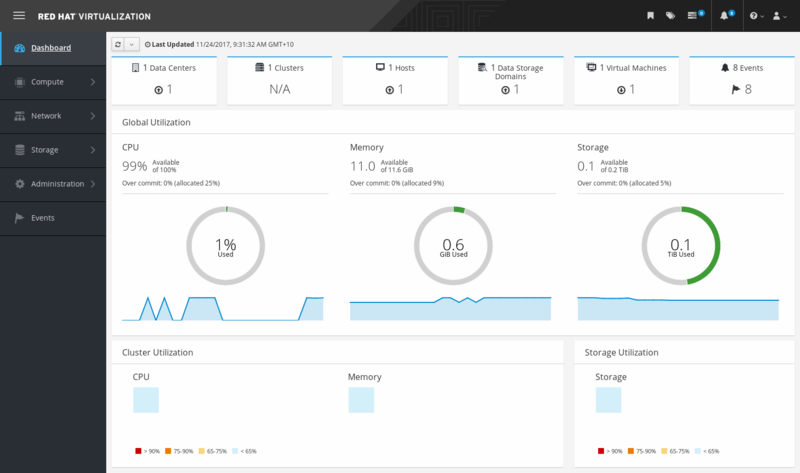 The Dashboard provides an overview of the Red Hat Virtualization system status by displaying a summary of Red Hat Virtualization’s resources and utilization. This summary can alert you to a problem and allows you to analyze the problem area. The information in the dashboard is updated every 15 minutes by default from Data Warehouse, and every 15 seconds by default by the Manager API, or whenever the Dashboard is refreshed. The Dashboard is refreshed when the user changes back from another page or when manually refreshed. The Dashboard does not automatically refresh. The inventory card information is supplied by the Manager API and the utilization information is supplied by Data Warehouse. The Dashboard is implemented as a UI plugin component, which is automatically installed and upgraded alongside the Manager. The Dashboard requires that Data Warehouse is installed and configured. See Installing and Configuring Data Warehouse in the Data Warehouse Guide.